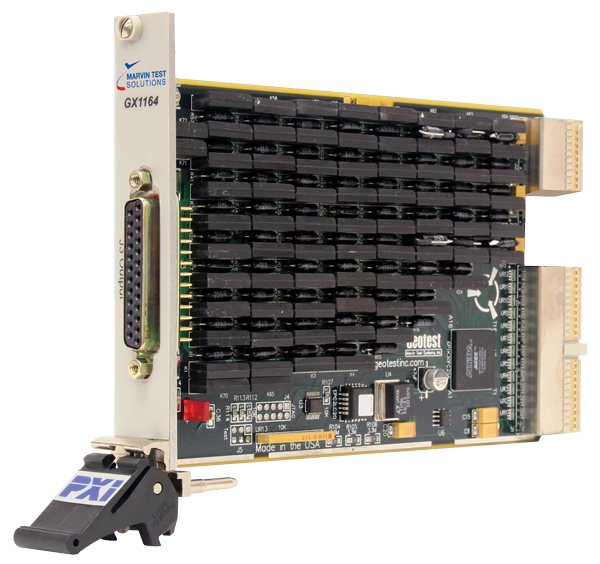 PXI Programmable Resistor Board - GX1164 | Marvin Test Solutions, Inc. The GX1164 can be used in multiple configurations including an 8 channel, 4 channel, two channel, 1 channel or 2 channel potentiometer with wiper configuration. The GX1164 includes an on-board EEPROM that contains calibration data. The EEPROM can also be used to "personalize" the GX1164 for custom resistance ranges and resolutions. The board is supplied with the GXPRES software, a software package that includes a virtual instrument panel, and a Windows 32/64-bit DLL driver library and documentation. The virtual panel can be used to interactively program and control the instrument from a window that displays the instrument’s current settings and status. In addition, interface files are provided to support access to programming tools and languages such as ATEasy, LabView, LabView/Real-Time, C/C++, Microsoft Visual Basic®, Delphi, and Pascal. An On-Line help file and PDF User's Guide provides documentation that includes instructions for installing, using and programming the board. 8 Ω to 512 kΩ.